The following article was sourced, with permission, from the writings of Murray John Henderson. When John May, aged 58, and his wife Janet, aged 50, migrated to New Zealand from Scotland in 1886, they came with six of their children (ages ranging from 13-24), their son-in-law and three year old grandson. They settled at The Halfway (now Glenside) and called their 65 acre farm Glenugie, after the River Ugie and Ugie valley of their homeland. This is the story of the children of John and Janet May. Seated: Augustus, Dora, Captain John Henderson, Gladys Jean, Mrs Mary Henderson, Jane, Russell, Lucy, James. Image: Murray Henderson Collection, Glenside Progressive Assn. Inc.
Mary Jane May (1862-1932) married Captain John Henderson (1852-1924). The family had ten children. John Henderson and his brother began their seafaring careers as young seaman on a schooner under the command of their father out of Peterhead, Scotland. The brothers served in deep-sea vessels to many parts of the world. After his marriage to Mary Jane May in 1881, John assumed his first command, the topsail schooner Minnie. In August 1882 he took his 20 year old wife with him on the Minnie, on a long trading voyage. In May 1883, when sailing between England and Germany, Mary Jane gave birth to her first child, son John, who became known as John Seaborn Henderson. 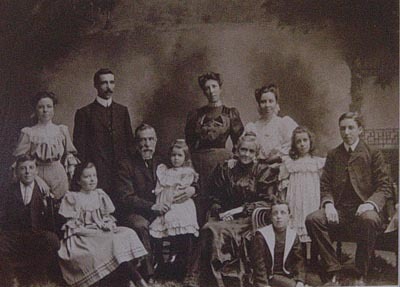 The Henderson’s accompanied the May family to New Zealand in 1886. After their arrival in New Zealand, John Henderson sought employment in the maritime industry and Mary Jane and his son John remained living at Glenugie with her parents. A daughter, Janet (known as Jessie) was born at Glenugie in 1887. In 1888 Captain Henderson joined the Wellington Habour Board as Coxswain/Assistant Pilot at the Pilot Station then situated at Worser Bay near the harbour entrance. A cottage went with the job and the family took up residence there. However, in 1891 Mary Jane returned to Glenugie to give birth to her third child, a daughter, Alexandra. In 1894 Captain Henderson was offered and accepted a position in the Harbour Board’s Wharfingering Department which he filled until his retirement. The family moved to Moir Street. Mount Victoria, and in 1899 to nearby Ellice Avenue. On 30 November 1918 after 30 years service, at the age of 66, Captain John Henderson retired from the Wellington Harbour Board. On his retirement the Henderson’s lived at Johnsonville where John Henderson died on 9 August 1924 in his 72 year. Mary Jane died on 23 February 1932 at the age of 70. Both are buried in the Wesleyan Methodist Cemetery at Johnsonville. The family had one child. Gus Wybourn came to New Zealand in 1886 and took employment with the Mental Hospital Service. Whilst serving as Head Attendant and Farm Manager at Porirua Hospital he met Eliza Jane. At the time the May family were living at Glenugie. Eliza Joan, popularly known as “Wannie” was a teacher at Johnsonville School and judging by the written testimonials she brought with her from various training institutions in Scotland, she was very talented and highly regarded in her chosen profession. Both she and her younger sister Paulina, also a qualified teacher and musician, together with their friends, used to entertain the patients at Porirua Hospital and it was whilst performing that Eliza Joan first met her future husband. Following their marriage in 1893, Gus and Eliza Joan moved to Auckland where their only child, daughter Ann was born in 1895. They stayed there for several years before returning to Johnsonville where they lived in Railway Terrace (now Frankmore Avenue). Gus Wybourne retired as Superintendant in the Mental Hospitals Division. Both are buried in the Johnsonville Wesleyan Methodist Church Cemetery. Jessie was the only one of John and Jane May’s family not to marry and after arrival in New Zealand she continued to live with her parents, first at Glenugie and then at Johnsonville. Jessie trained as a dressmaker and soon after the May’s moved to their property in Johnsonville a workroom and small shop was built for her on the corner of Trafalger Street and Railway Terrace (now Frankmore Avenue) next to their house. For many years she conducted a very successful business there, at one time employing several women assistants. Following the deaths of her father in 1907 and mother in 1909, Jessie continued to live at the Trafalger Street house until sometime later a new house was built for her on the rear part of the May’s corner section. For more than forty years she was a well known identity in the Johnsonville community – much admired and highly respected by all. Jessie May died on 7 November 1946 at the age of 80 and is buried in the family grave in the Johnsonville-Wesleyan Methodist Church Cemetery. Soon after John May had set up his fishing operation at Paremata he was joined by Thompson Bruce, an experienced young fisherman also from Peterhead, who had followed the May family to New Zealand. Thomson Bruce (always known as Tom) and John May’s son John Alexander, would later become partners in the fishing company J May & Co. which operated very successfully on shore-front land at Paremata leased from the Wellington and Manawatu Railway Company. He married Barbara in 1894 in Wellington. At one time they lived in Johnsonville. They eventually settled in Paremata where they and their family lived for a short while at the eastern end of Hobson Street (now long gone) on the waterfront a short distance from the sheds where the smoking and curing took place. They soon became respected members of that growing community. Two years after the death of John May, his son John withdrew from the fishing company to pursue other business opportunities and Tom Bruce took it over and continued the operation for many years. Tom and Barbara’s house Gowanbrae, on the hill above Paremata Village overlooking the harbour entrance, became their home for the remainder of their lives. Barbara died on 14 April 1946 aged 78 years and Tom died on 9 January age of 82. Both are buried in the St Alban’s Church cemetery at Pauatahanui. John and Janet May’s only son, John Alexander, was sixteen years old when the family came to New Zealand in 1886, and whilst being expected to pull his weight on the farm, his early years at Glenugie must have been both enjoyable and challenging for him as a teenager. Within the next few years he had progressed from being merely a young helper in his father’s fishing enterprise, J May & Co at Paremata. He continued to be involved until 1909 when he withdrew and handed over to his brother-in-law Thomson Bruce. John Alex, as he was known, met his future wife through family friends who lived at Tawa Flat (now Tawa). They married on 5th December 1894 and first lived at Plimmerton. Soon after they moved to a house that he had built on a small section on the seaward side of the railway at the southern end of the Paremata Village. In about 1900 this house was dismantled and re-erected on a section John Alex had bought in Trafalger Street, Johnsonville. When he withdrew from the fishing partnership at Paremata, John Alex bought a house on Johnsonville’s main road, built a double fronted shop on the front, and started a grocery and drapery business. After the NZ Railways bought this property he built a small lock-up grocery shop on the May land in Trafalger Street and the family again moved into a rented house. Whilst living in Johnsonville, John Alex and Minnie were very much a part of the community and were highly regarded by all those who knew them. John Alex became active in the Masonic Lodge and at one time was Chairman of the Johnsonville Town Board. He altered and extended the house he still owned in Trafalger Street and the family moved back in about 1919. By this time his health began to deteriorate quite rapidly and he and Minnie decided to move away from Johnsonville. They eventually chose Khandallah where a sizable section in Izard Street (now Cashmere Avenue) was purchased and they and their family of four soon moved into a new house they had built there, beginning a very long association with that suburb. John Alexander died on 23 December 1921 at the age of 51 and Minnie May died on 8 May 1946 aged 72. John Alex is buried in St John’s Anglican Church Cemetery at Johnsonville and after cremation, Minnie’s ashes were placed in the grave of her husband. The youngest of John and Janet May’s children when the family arrived in New Zealand was thirteen year old Paulina. For the next twenty years she lived with her parents at both Glenugie farm and at Johnsonville. Paulina was a gifted pianist and certificates, each attesting to high marks, were issued following examinations set by Trinity College London. She also had a fine voice and like others in the May family, singing was a major part of her life. She was married on 23 October 1907 at Johnsonville to Clarence Hendry Bould of Johnsonville. Clarence first worked as a warehouse assistant and later ran his own tobbaconist and hairdressing shop in Levin. He was known to have engaged in big game hunting in South Africa and it was during a visit to that country, probably in pusuit of that interest, that Paulina died at Durban on 30 December 1933 at the age of 60 years. Clarence returned to South Africa in 1934 and once more set up a tobacconist and hairdressing shop in Durban. He died on 15 Deptember 1941 aged 61 at Durban and is buried there. Paulina’s death is recorded on the May family grave in the Johnsonville Methodist Church Cemetery. They had one child, a son. From Glen to Glen The Story of John and Janet May, Their ancestors and descendants. Privately published family history.